Colds, flu, infections, insect-borne pathogens. Poisons, curses, spells. Huddling for warmth. Cool cloths. Unanticipated handsiness. Delirious confessions of love. Confessions of love while the other person is unconscious. Repressed memories rising to the surface. 01. Prompts should have fever as one of their elements (or as an implied part of the prompt, like “appendicitis”). Other than that, be as inventive as you like about the causes and effects of said fever. This is a multi-fandom meme. Prompts involving any characters from any fandom are welcome. Crossover prompts are welcome. RPF/ RPS is also welcome. 02. This post is mirrored on LJ /DW. You may prompt where you like and post where you like. That is, you can take a post from DW and post it to LJ and vice versa--just write FILLED in your subject line when you post a comment with a fill, and, if possible, link to the original prompt. The masterlist will cover both sites. 04. You can leave as many prompts as you like, but one prompt per comment, please. If you've got a few, comment with each separately. 05. Your prompts can be as short or as detailed as you’d like. 06. Scroll through the comments and when/if you find a prompt you like, write a fic in reply to the comment. 07. More than one comment-fic response to a prompt is totally acceptable, and in fact encouraged. The more fic, the better! 08. Art submissions are very much accepted too! 09. When replying to a prompt with your comment-fic, put ‘FILLED’ in your subject line and then anything else you want, ie: a title if you have one/part numbers/rating. It’s not a big deal if you forget this step, but it will make it easier for people to find your fic, and for me when I’m compiling the masterlist. Consider including warnings if the fic features non-con or non-canonical character death. 10. I have enabled anonymous posting, but I am screening anonymous comments, and I won't unscreen anything rude or disrespectful of authors, characters or prompts. I also reserve the right to delete named comments that are rude or disrespectful. 11. NO SPOILERS for unaired episodes, please. If you're prompting something from a recently aired episode, please be courteous and note that there may be spoilers before you get to the main part of your request. 12. Likewise, no character bashing, or rudeness in general. 13. Do feed your authors! They’re awesome. 14. If you want to advertise this, that’s fantastic! It would be really appreciated. There are some banners here, but if anyone feels like making more for newer fandoms, that would be awesome. •Yes, if your fic gets too long for a comment-fic, you can comment with the link to it at lj/dw/AO3. •Because it bears repeating - yes, art is more than welcome as well as fic. •As for a timeframe - this post will be open for prompting at least until June 17. There’s no exact timeframe, because I play it by ear and don’t close it until I see it’s starting to slow down. In any case, it will stay open indefinitely for new comment-fics and comments/feedback. Any other questions? Feel free to PM me. Lovely banner by norgbelulah. Thanks to hoodie_time for letting me borrow its excellent rules. Here are the master lists for 2011 and 2012 if you want to do some reading to get in the mood! 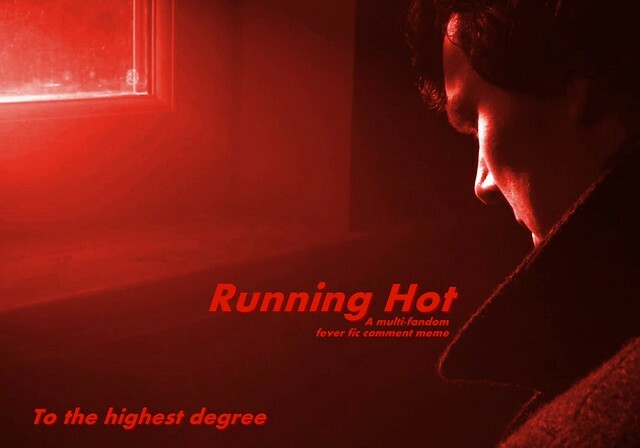 NB: There is an AO3 collection for Running Hot. If you want to post a fic your write to the collection, just follow the link and click on "post to collection." If you have a fic on AO3 you wrote last year for the meme, you can edit the "does this belong to a collection" box to have it added to the Running Hot collection. PROMPT AWAY AND HAVE FUN! Neal gets sick with a high fever and goes walking outside of his radius. The US Marshals come to get him but don't realize he's sick until Peter (or another character) comes to collect him. Reid is ill--woozy, voice-less, unable to make good decisions. For whatever reason, this needs to be hidden from the bad guys/ power that be, and it's up to Drake and Jackson to make this happen. What's worse, they actually have to work together! all pairings, all ratings, fine with me. This one is calling out to me. There's a nasty flu going around Oxford CID and Hathaway's been putting in long hours manning the fort. How long 'til he succumbs himself? I would love some minor illness!h/c with any of the boys. A bad night after a long shoot, that kind of thing. All pairings, all ratings, are great--as is friendship/gen. would you like me to set up the sub-collection for this one? that would be awesome--thank you! Lewis. James/Robbie or no pairing. Innocent has a high fever ( ? Meningitis or something similar) and Lewis is in temporary charge ( maybe he is the most senior DI around - others at a conference? ). Innocent keeps sending him messages and it takes a while to work out which ones are fever- driven. Chance for lots of humour. Cabin Pressure. Martin/ Douglas. Martin starts to feel ill on/ before a flight but thinks it's minor. Douglas finally notices. By the time they get to their destination Martin is in no state to look after himself and Arthur is not a lot of help. ooo! I just started listening to Cabin Pressure! I hope someone fills this! Lynley. Lynley/Havers. When all your life you have been taught control a fever can turn you into a child again. Stargate Atlantis. John/Rodney. John only went with Rodney to avoid his family and now they are stuck in a building with its heating on full blast in the middle of the desert. Ella is under the weather; Walter is a surprisingly good nurse. The Flame Alchemist is burning up. A high fever lands Roy Mustang in a field hospital in Ishbal. Peter and Neal are stuck somewhere with no access to medical help and meds (trapped, kidnapped?). Neal is injured and the wound gets seriously infected. He spikes a very high fever and is pretty much fighting for his life while all Peter can do is hold him and beg him not to give up. Much drama and angst, tears and maybe declarations of love - anything goes. [Are people still cutting for IM3 spoilers? ]Sure, Tony can work out the problems with Extremis, but he can't make the process a pleasant one, or a short one. Over the long course of the treatment Pepper is miserable and feverish. Tony (and/or Rhodey, Happy, or whomever else you'd like too!) tries to be comforting, and sometimes mostly succeeds. Charlie finds it hard to maintain a state of zen with everyone brandishing thermometers at him.